The warm conditions continue to push crops along. Across the state we are approximately 140 to 370 Growing Degree Days (GDD’s) head of normal. Most corn and soybean fields are now in the reproductive stages. 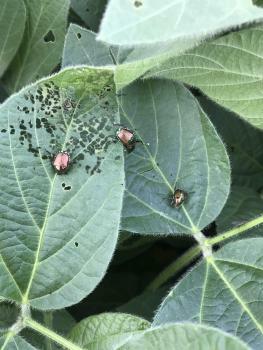 Excessive moisture, drought, gray leaf spot, Japanese beetles, and off-target herbicide movement seem to be common issues Iowa State University Extension and Outreach field agronomists are seeing across the state this past week. 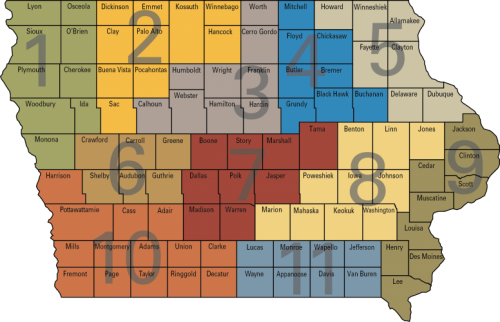 Read on for more information about your region’s crop progress and field conditions. Rainfall totals for the past week (July 2 to July 9) across the state of Iowa. Source: http://www.weather.gov. 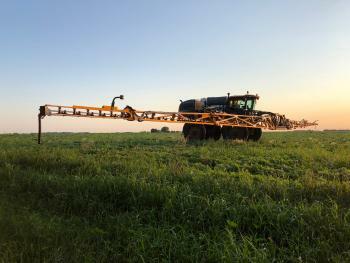 Paul Kassel (Region 2): "Farmers and commercial applications were hard at work last week with herbicide applications for the soybean crop. Large weed size, windy conditions, and wet fields presented a challenge for many applicators. The pre-emergence herbicide applications on soybean fields performed quite well this season. However, a few fields without pre-emergence or burndown herbicide applications had some 24 to 36 inch weeds that may present a problem to control. There is also some aerial application of urea being applied to help the nitrogen status on some of the corn fields. This is a difficult decision for farmers since the corn fields are extremely variable and not all of the field will benefit from the nitrogen application. Some of the soybean fields are looking better and have somewhat recovered from the waterlogged conditions of June. However, many of the areas in the corn fields that were stunted by the waterlogged conditions have not recovered and continue to appear stressed." This applicator patiently waits for better conditions to treat this weedy soybean field. Photo by Paul Kassel. 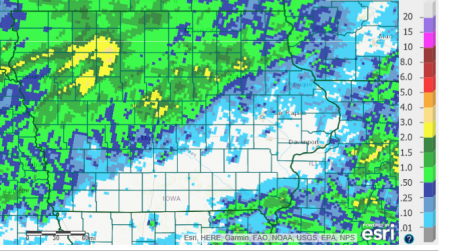 Terry Basol (Region 4): “Considering the ample amount of rainfall over the past couple of weeks in Northeast Iowa, corn and soybeans are holding their own. According to the Iowa Mesonet, we received about 4.3 inches of rain from June 24 through July 8 at the NE Iowa Research and Demonstration Farm near Nashua. Most of the corn in the southern two-thirds of my territory has reached the R1 (silking) stage, with the rest of the corn throughout the territory in the mid to late vegetative stages (depending on planting date). I have seen some Physoderma brown spot showing up in corn fields last week due to favorable weather conditions. Green snap in corn fields has also been observed, particularly since the storm event on June 30th, which produced up to 50 – 60 mph winds across much of my territory. Soybeans are generally in the R1 (open flower at any node on the main stem) to R2 (open flower at one of the two uppermost nodes with a fully developed leaf) growth stage throughout my territory. Septoria brown spot remains to be found in the lower canopy; continue to scout and monitor to determine if it moves into the mid-canopy. There have been some reports of Phytophthora root and stem rot in soybean in the North Central and Northeast parts of the state due to the excessive rainfall and prolonged periods of saturated soils. So far, soybean aphid levels remain low from the weekly counts that ISU field agronomist Brian Lang conducts during the growing season. 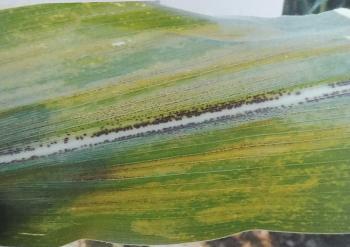 Physoderma brown spot lesions on the midrib of a corn leaf. ​​Source: Farmers Guide to Corn disease IPM 76. 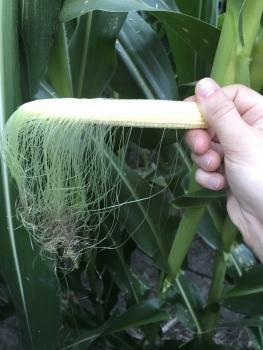 Checking on pollination in a corn field. Silks still attached indicate that those ovules have not yet pollinated. Photo by Rebecca Vittetoe. Some minor skeletonization or defoliation of soybean leaves caused by Japanese beetles. Photo by Rebecca Vittetoe.